Though the connection is pretty much forgotten today, Solomon Grundy was one of those comicbook villains who was created specifically to take advantage of the hero's weakness. Like Sinestro, he fought Green Lantern; unlike Sinestro, he didn't use yellow. So how did that work? Because he didn't fight Hal Jordan, he fought Alan Scott. 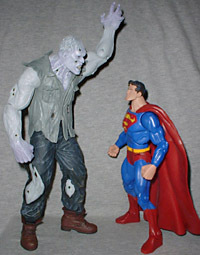 The slow-witted, monstrous behemoth known as Solomon Grundy is an almost unstoppable foe for the Justice League! When he was Green Lantern, Alan Scott's weakness was wood. Grundy qualified because, as his body decomposed in Slaughter Swamp, his bones were covered with dead leaves and muck, forming a new body. Yes, like Swamp Thing, he's a plant that thinks he's a man. In fact, he was used (in continuity) as a prototype Swamp Thing - the forces that turned Alec Holland into the defender of the green were practicing when they made Grundy. He didn't work. The sculpt is good, as the Alex Ross figures almost always are. Grundy's wearing a tattered sleeveless shirt and has a few big tears in his pants. Since zombies can't tie shoes, his boots are loose on his feet. His arms are thick and muscled, and the tendons in his neck seem to be straining to keep his head in place. His head is a weird shape, and his stringy hair is clumped on top. 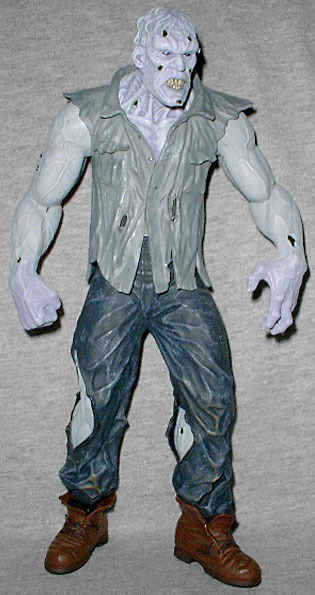 Grundy's skin is a chalky white, though his hands have a slight purple tint to them and there's a wash over his whole body to bring out the detail. His teeth are yellowing, and all the holes are black with a bit of blue around the edges. His shirt is gray, and his pants look like they were once black, until they faded. His boots are brown, with black soles and laces. Alex's Grundy is based, quite blatantly, on one of the spooks from Thirteen Ghosts - one called "The Juggernaut," formerly a serial killer named Horace "Breaker" Mahoney. Breaker would tow stranded motorists to his junkyard, then tear them apart by hand. He was too big and dangerous to bring in, so the police simply shot him down. Ross has never been shy about using outside sources for his artwork, and the choice to use John DeSantis' ghost make-up worked well, here. The figure is big - 8" tall - which makes him mighty even by the standards of the over-sized Justice line. Since he's supposed to be a giant, that makes him a perfect fit for pretty much any figure you want to put next to him. Articulation is not so good. Grundy moves at the head, shoulders, elbows and waist. Yes, hooray for a DCD waist, but nothing in the legs? No wrists? A plain peg joint for the head? His shoulders are the only balljoints, so at least they have a good range of motion. His feet feel like they move, but no - his "ankles" are just square pegs in square holes. Since Solomon's legs are solid, you'd think he'd be very stable, but no. 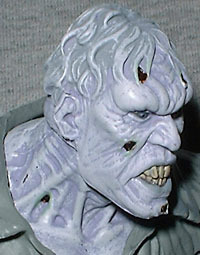 The lack of joints means you can't compensate for any imperfections or bends in the legs, and Grundy's feet aren't even. Straight out of the package, he was leaning far enough to topple forward. The included base, the same that all the Justice figures have, keeps him standing, but he can get a bit wobbly when off of it. Solomon Grundy is sort of a perennial villain. His first appearance ended when Green Lantern threw him under a moving train, but that didn't stop him. He was part of the Legion of Doom on Superfriends, which is why he's in Justice: the whole series is pretty much Ross' effort to legitimatize the old cartoon. His portrayal there, as a retarded southerner, was the inspiration for Racist Frankenstein on the marginally funny Minoriteam. He showed up on Justice League Unlimited, and he keeps popping up in the comics pretty regularly. You just can't keep a good zombie down.